 "Ausf." is the abbreviated form of the word "Ausfuhrung" meaning simply: model, design or mark. 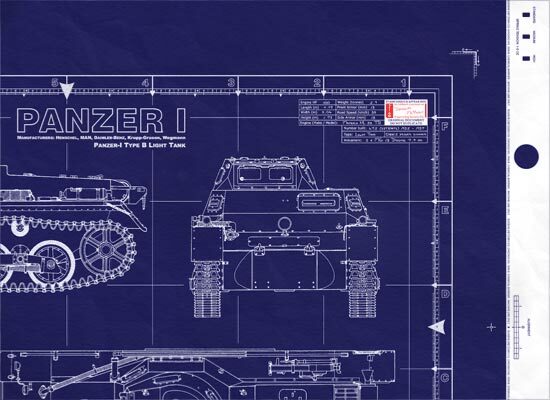 Panzer I Ausf.B - This is a real blueprint made directly from vellum masters. Delivered to you on a full size master sheet measuring 42"x 30". The blueprint will arrive uncut, edge not slit, or trimmed, and are marked for proper 36"x24" finishing. 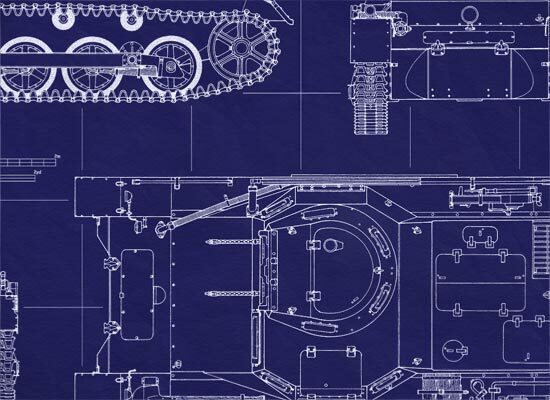 This is a detailed general arrangement plan (standard blueprint cover-sheet) of the first German tank to go into mass-production. The Panzer I Ausf.B Tank was officially known as: Pz.Kpfw. I Ausf.B (Sd.Kfz.101). Originally designed as a light training tank… it gave German industry experience in producing tanks while development work on the real combat tanks was underway, and to train the new armored divisions. The blueprint will arrive uncut, edge not slit, or trimmed, and are marked for proper 36"x24" finishing. 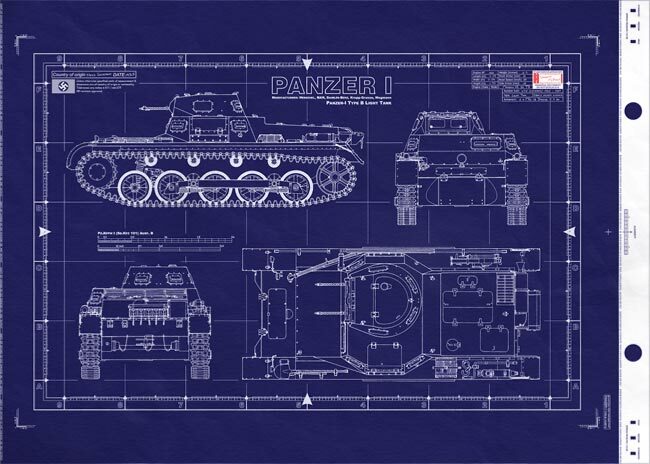 This is a detailed general arrangement plan ( standard blueprint cover-sheet ) of the first German tank to go into mass-production . Continued from above… note the German designation for its military vehicles. This makes understanding the different models quick and easy. The abbreviation Pz.Kpfw . covers "Panzerkampfwagen" and translates to "armored fighting vehicle". Likewise, the abbreviation Sd.Kfz . covers "Sonderkraftfahrzeug" and translates to "special motor vehicle". Model variants are covered in the convention of Ausf.A, Ausf.B... et cetera. " Ausf. " is the abbreviated form of the word "Ausfuhrung and is the general term used to cover "model" or "mark" in showcasing a variant of note. It is the first Panzer and second (type B) model or Mark (Mk.). Now that was both quick and easy! Even though I am a U.S. Citizen (notable Norwegian ancestry), I must admit I am quite partial to the Panzer Tanks. German quality is always good (as we know from their WWII aircraft) and tanks were no different. Perhaps being backed into a corner as the war progressed, Germany had no choice but to match the amazing Soviet T-34 tanks with their feared Panther (Panzer V) or the even more powerful Tiger and King Tiger tanks (Panzer VI or rather PzKpfw VI). But back to the first Panzer that started it all... Panzer I Ausf.B. This is the first tank developed by the new Mechanized German Army, paving the way for the Blitzkrieg (Lightning War) later. Contrary to the original plan, the Panzer I not only was used for training, but also participated in the Poland and North Africa campaigns. Ausf.B is the lengthened version of the Panzer I. The first production version of the Panzer I had been found to be underpowered and its engine prone to overheating. To solve these problems the superstructure and turret from that version were matched with a longer chassis designed for the Kleiner Panzerbefehlswagen command vehicle to produce the Panzerkampfwagen I Ausf B. The new version was also given a more powerful 100hp Maybach water cooled engine to replace the 60hp Krupp air cooled engine of the Ausf A. The two versions of the Panzer I can easily be told apart by the number of road wheels ? four on the Ausf A and five on the Ausf B. This Ausf. B vehicle was one of the most mass-produced of the Panzer I series. The Panzer Ausf B light tank was otherwise similar to the Ausf A, featuring the same hand cranked turret armed with two 7.92mm machine guns. At the start of the Second World War the major of Ausf Bs were still in service with front line units, serving in Poland and France, despite not having been designed as a combat vehicle. Most had been withdrawn from front line units by the start of Operation Barbarossa. 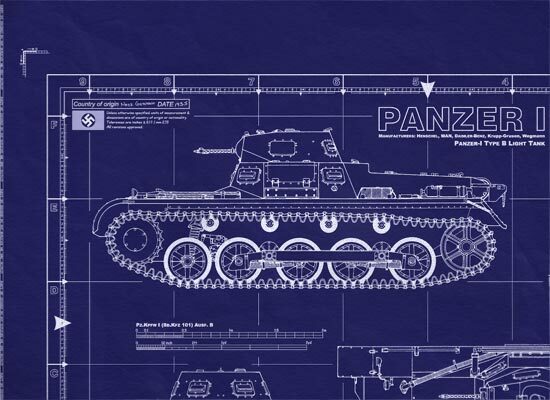 Few could have known what the inception of the Panzer I into the German Army inventory during the middle portion of the 1930s had in store for the future of Europe. The Panzer I went on to begin the long and successful family line of tanks encountered in the German Army through all of World War 2. Each system grew progressively larger and more lethal than her predecessor but they all had the Panzer I to thank for their origins. The little tank served through the first major invasions of Europe, was modified to fit other battlefield-required forms and fought on into 1944. It is reported that some 2,800 Panzer I tanks of all types were ultimately produced. Version B was equipped with six-cylinder Maybach HL 38 engine on the TR of 100 horsepower at 3,000 revolutions per minute. Panzer I Ausf.B was an improved version of Ausf.A. Both models had identical turret and superstructure but Ausf B was longer (additional road-wheel) and had new modified engine deck (new 100hp Maybach engine ). Both variants were operated by two men crew - a driver and a commander/gunner. The main armament consisted of two 7.92mm MG13 Dreyse machine guns with rate of fire of 650 rounds per minute. Long before the massive Tiger and Panthers rolled into battle, Germany's entire armored forces relied on this vehicle, the Panzer I. It was early training and limited combat experience with these vehicles that allowed the Germans to develop both Blitzkrieg warfare and more heavier tanks to make it effective. In 1933 the German Army Weapons Department issued a requirement for a light armoured vehicle weighing about 5000kg (11,025 lb) that could be used for training purposes, and five companies subsequently built prototype vehicles. After trials the Army Weapons Department accepted the Krupp design for further development, the design company being responsible for the chassis and Daimler-Benz for the superstructure. To conceal the real use of the vehicle the Army Weapons Department called the vehicle the Landwirtschaftlicher Schlepper (industrial tractor). The first batch of 150 vehicles was ordered from Henschel, and production commenced in July 1934 under the designation PzKpfw I(MG) (SdKfz 101) Ausf A and powered by a Krupp M 305 petrol engine developing only 57 hp (42 kW). There issues (overheating & under powered) with the engine, however, and the next batch Ausf B had a more powerful engine which meant that the hull had to be longer and an additional road-wheel added on each side. This model was a little heavier, but its more powerful engine gave it a maximum road speed of 40 km/h (25 mph). This entered service in 1935 under the designation of the PzKpfw 1 (SdKfz 101) Ausf B. The PzKpfw I was first used operationally in the Spanish Civil War, and in the invasion of Poland in 1939 no less than 1,445 such vehicles were on strength. It had already been realized, however, that the vehicle was ill-suited for front-line use because of its lack of firepower and armour protection (7-13mm/0.28- 0.51 in), and in the invasion of France in 1940 523 were used, although many more were still in Poland. By the end of 1941 the PzKpfw I had been phased out of front-line service. Even though it was light, the Panzer I still would bog down in the mud, as it did during the Polish counterattack along the River Bzura. Poland... around 1,077 Panzer I's were still being used in the German Army, and of these, 619 were used in the invasion, with the rest being converted, used for training, or used for garrison duties. They were primarily used for reconnaissance, but even then, there were heavy losses when meeting British or French armor. Armed with two machine guns, the Panzer I was intended primarily for training and development, yet it served extensively in the Polish and French campaigns after which it was slowly withdrawn from front-line units. The chassis served as a basis for a command version and self-propelled guns. In pre-war Germany the Panzer I was then used extensively in military maneuvers (in addition to training new tank crew) and propaganda shows. Despite the fact that from the very beginning of its development the Panzer I was not considered a full-blown fighting machine. They were also relatively abundant in the early Panzer War Theater. This was mainly due to Hitler's decision to initiate war. In September 1939, when he ordered the attack on Poland, German troops did not have enough Panzer III and Panzer IV tanks to form their backbone. During the Polish campaign the Panzer I accounted for nearly 50% of all deployed tanks. The German ?Panzer I? was Germany?s light tank at the start of the Second World War. Produced by the Krupp Company. This model has the 100 horsepower, 6-cylinder, water-cooled Maybach engine replaced the former Krupp air-cooled engine. With a bore of 90 mm and piston stroke of 100 mm the engine develops 100 h.p. at 3000 r.p.m. The valves are single overhead camshaft driven from helical timing gears at the rear of the engine, operating two inclined valves per cylinder through rockers mounted on independent shafts, one for inlet and one for exhaust The rockers are operated through rollers. Valve clearance is adjusted by rotation of eccentric bushings on rocker shafts. A Solex duplex type carburetor is utilized, and a Pallas gasoline fuel pump incorporating a bowl filter and hand primer, the latter operated by remote control from the fighting compartment. The transmission and steering mechanism remain the same as Model A. Installing the new unit, however, required enlarging the engine compartment and thus the extension of the chassis. On each side were added to a running wheel. Maintained by an independent suspension first round of the running coil spring, the other four casters pairs was then sprung by leaf springs and a separate from outside the flat beam similar to the version of A. The rear wheel tension was now suspended and sprung individually and above wheel casters. The location or design of the front wheel tension remained unchanged. Number of support rollers, after which the band went back ahead in the teeth of the driving wheel, rose to four. The turret, from which the gunner?s seat is suspended, is hand traversed through 360?. The turret floor does not revolve. The inside diameter of the turret ring is 36 1/2 inches. The hull and superstructure are essentially the same as Model A. Superstructure, tower and tank armament remained the same as the Ausf. A. In version B radio became standard equipment for communicating with other machines in the field. The armament consists of two turret-mounted 7.92 mm M. G. 13′s. Five smoke candles are carried on a rack at the rear and may be released from inside the tank. The suspension differs from Model A in that an additional bogie wheel has been utilized. The trailing idler has been replaced by a rear elevated idler. There is also an additional return roller. The quarter elliptic spring is anchored to the under side of the transverse bogie casting allowing the spring to bump its own opposite end. The coil spring is not used except for the forward independently mounted bogie wheel. There are 99 links in the tracks.